Since the premiere of Black Swan in theatres, you may have noticed fans have been… er, flocking to dance and fitness studios. Whether nostalgic for their days as a dancing youth or inspired to obtain a more svelte physique, audiences definitely have ballet on the brain lately. Last month, as the Black Swan Blu-Ray and DVD release neared, Twentieth Century Fox Home Entertainment partnered with The Bar Method, a unique full-body exercise program that utilizes the ballet bar in its technique. 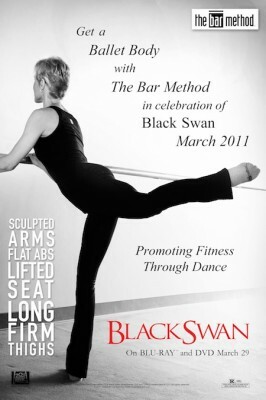 Bar Method studios across the country offered ongoing Black Swan sponsored training sessions. Dance Advantage columnist Lauren Warnecke (Art Intercepts) was on hand to attend a class at The Bar Method Chicago. Her thoughts are below. the 411 on The Bar Method as founder, Burr Leonard chats with me about the fitness program, its relationship to dance and with dancers, and of course, Black Swan. The Bar Method is based on the technique of Lotte Berk, who was a German dancer. After studying and then teaching Berk’s method for 20 years, Ms. Leonard broke away and founded The Bar Method. This happens a lot in somatic techniques, exercise development, and training, and for dancers and teachers it probably needs no explanation that as you teach, you learn from your students, adapt, tweak, and develop new methods until often they become something other than what you were originally taught. 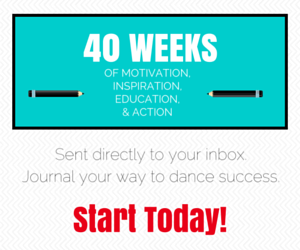 Dance Advantage: You began teaching the Lotte Berk Method in 1991. Can you briefly describe how The Bar Method is different from the technique you initially fell in love with in 1981? Burr Leonard: Both techniques are effective workouts. The Bar Method differs in that it is safer for students’ shoulders, backs, hips and knees; more focused on alignment and good posture; more efficient at isolating and reshaping the key muscles involved body change; more challenging due to more adeptly targeted exercises; more aerobic due to faster pacing; and more strongly founded on rigorous teacher training, a hallmark of The Bar Method. DA: Do you have dance training in your background? BL: I studied ballet and jazz from 1981 to 1991 at Steps Studio in New York City. DA: On your website, you have a helpful Q&A that includes ‘How is The Bar Method different from Yoga?’ and ‘…different from Pilates?’ Tell us, how is The Bar Method different from Ballet? BL: In my view exercise and dance are in many ways opposite from one another. Dance uses movement to create beautiful, meaningful and surprising patterns that evoke emotion and joy for the viewers. Exercise uses motion to create specific sensations in students’ muscles and ultimately to change their bodies and inner spirits. This difference in purpose makes dance choreography and exercise choreography essentially different from one another. A dance motion that is inventive is not necessarily one that works in exercise. We teachers have an expression, “choreographitis,” which refers to the tendency on the part of rookie teachers to choreograph exercises based on how they look without a full understanding of how their students will physically and mentally experience the motions. Paradoxically, the most simple-seeming choreography in an exercise class is sometimes the most inventive and fascinating for students, which is the opposite in dance. DA: Do you find that dance professionals and/or students are attracted to The Bar Method? BL: Bar Method students who are professional dancers are rare, though they do exist. Most dancers, I think, are wary of getting too close to an exercise system that might change their bodies away from the ideal they’ve strived to achieve for many years, or that might throw off the delicate muscle balance In their legs by focusing on some muscle groups more than other. It’s more common for former dancers to fall in love with the Bar Method. There are lots of those in our classes. I believe that the Bar Method would in fact benefit many currently active dancers if they would just try it. The class would add a degree of strength and power to their thighs, adductors, hamstrings and abs and would gently stretch typically tight muscles such as their hip-flexors. I don’t think it would detract from the strength of their sartorial muscles, for example, but would compliment that strength. DA: Which exercises (or parts of class) seem to be dancer favorites? DA: Lots of workout programs, including others that utilize the ballet barre as equipment, claim to give practitioners a “dancer’s body.” What makes The Bar Method more effective in this regard? BL: Bar Fitness workouts have proliferated, but the Bar Method is the only one of them that shares its teaching technique with dance. A ballet teacher continually adjusts students’ form, placement, alignment and quality of motion. A Bar Method teacher does the same with her or his students. Uniquely, our teachers undergo months of intensive training to develop what we call “verbal and hands-on adjusting” skills. These techniques enable teachers to awaken in the desire and ability to work towards an ideal – just as dance teachers do. Our students tell us that a Bar Method class has a more organized, structured, and focused feel than other bar fitness classes for that reason. DA: And is a great workout alone enough to get that desired dancer body? BL: Yes, when taken three-to-five times a week over months and years. DA: Your father George Leonard, is quite well-known as a writer, educator, and a sensei of Aikido, Could you please briefly share how he has influenced your work? BL: In his 1992 book Mastery, The Keys to Success and Long-Term Fulfillment, my father wrote about the remarkable power of patient, focused, long-term practice to transform us inside and out, a concept he first experienced as a student of the Japanese martial art Aikido. I applied his insights to the teacher training system that I developed over my 20 years in fitness. Bar Method teachers learn techniques based on his writings on long-term practice that help their students transform their bodies and even their spirits over time. DA: The Bar Method is available in nearly 50 locations in North America but for those without classes nearby, you offer a variety of DVDs. Currently in my second trimester of pregnancy, I’m particularly curious about the Pregnancy workout DVD. What equipment is needed to work at home with these DVDs? BL: For the Pregnancy DVD workout, you need a sturdy chair or other piece of furniture, two two-to-three-pound free weights, two large throw pillows, an exercise mat (unless you’re on a soft carpeted floor), and a terry cloth bathroom belt for stretching. I think it’s a great DVD. I hope you try it! DA: So tell me, what did you enjoy most about Black Swan? BL: Natalie Portman’s wonderful performance. I had the opportunity of participating in a complimentary class at The Bar Method studio in the Lakeview neighborhood of Chicago, and today as I type I’m delightfully sore. Though it borrows a lot from Pilates and Yoga, the Bar Method has many exercises that are uniquely theirs due to the utilization of ballet barres, socks that slide easily over the carpeted studio floors, and (very loose) derivations of ballet technique. Their claim is that the Method produces a “dancer’s physique” including long, lean legs and arms, firm abs and buns, and a trimmed waistline. I found the class to be a positive experience; the staff were friendly and attentive, as was the instructor, who makes a specific point of using first names (which is a pleasant change from most group fitness classes at health clubs). Although I was not familiar with the Bar Method before my first class, the place was packed – mostly with fit-looking women under 40. While the Bar Method provided me with a great workout and a pleasant environment, I wouldn’t necessarily recommend it as appropriate cross-training for dancers. Many of the ideas that are borrowed from ballet are performed turned in, and nearly every exercise was executed with a tucked pelvis. This may produce the results that they claim (my fellow students all had nice, lean bodies), but as a dance teacher I spend a lot of time trying to get my students to use the rotation in their legs and to stop tucking the pelvis. Overall, I think that this training technique is great for parents of dancers who want to get ready for swimsuit season with a tiny bit of dance and “yogalates” in a pleasant group atmosphere. As for me, my experience at the Bar Method was a slightly painful reminder that I should spend a little less time writing and a little more time in ballet class. Dance Advantage readers in Chicago can get a Free Trial Class. Go to this special website and send a free trial to yourself or your friends: www.chicagobarmethod.com. Outside the Chicago area, you may want to take advantage of The Bar Method’s New Client Special: $100 for 30 Days of Unlimited Classes. Learn more at www.barmethod.com. Have you tried The Bar Method? Lauren, thanks for the personal review of the Bar method class. I’ve seen the class listed in LA but have never tried it and it’s good to know what it entails. Leigh – it’s my pleasure! Keep us posted if you decide to check it out! Thank you for an informative website-blog. I enjoyed the interview on Bar Method. Very refreshing. Straight info or qualified opinion. I just discovered your work and will continue to read for advice and reviews from a professional.